Ametrine tumbled quartz crystals with rainbows and reflective veils. 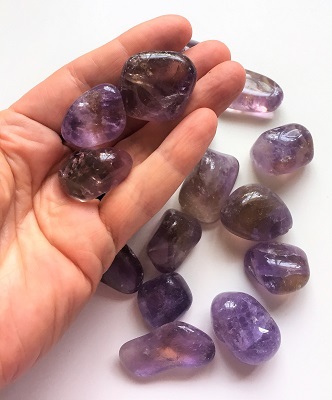 Purple with golden hues, these Ametrine tumbled quartz crystals have rainbows and reflective interior veils. Ametrine is powerful crystal tool energetically combining Amethyst and Citrine. Ametrine facilitates and provides protection during astral travel and relieves psychic attacks. Ametrine opens the Third Eye, promotes healing, divination and balances masculine and feminine energies. 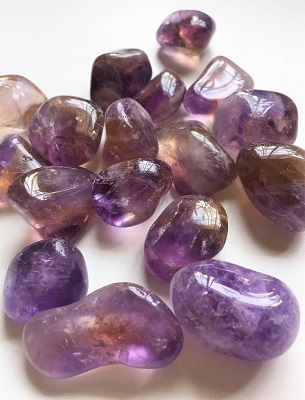 Ametrine brings greater focus to meditation, facilitates transformation and gets to the bottom of things. 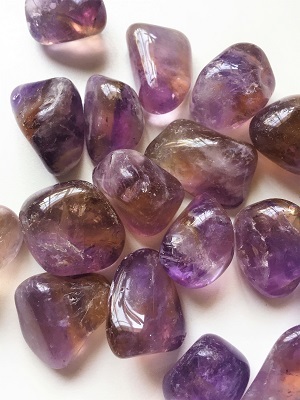 Holding Ametrine helps to bring deep seated issues to the surface. Ametrine disperses negativity from the aura and toxins from the body.